Conveniently located on Highway 89A, this hotel is 2 miles from Northern Light Balloon Expeditions. It features an outdoor pool with hot tub. Spacious guest rooms offer free Wi-Fi. Cable TV and a work desk are provided in every room at Hampton Inn Sedona. The traditionally decorated rooms feature video games and in-room coffee. 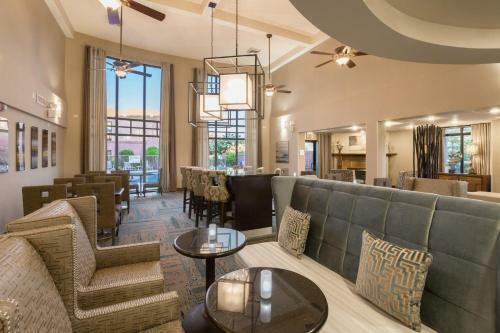 Start the day with Sedona Hampton Inn’s free breakfast buffet, offering a selection of hot items, pastries and cereal. Packed breakfast to-go bags are also available. Fitness and business facilities are located on-site. Concierge services are offered for guest convenience. Sedona Cultural Park and TLAQUEPAQUE shopping center are each a 4-minute drive from this hotel. Sedona Golf Resort is 9 miles away. the hotel Hampton Inn Sedona so we can give you detailed rates for the rooms in the desired period.